Hi everyone! I'm back with another vlog today! 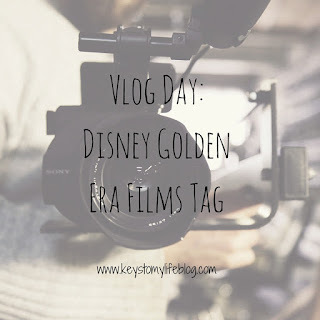 This tag is called the Disney Golden Era Films Tag, and my blogging buddy Becky, from Disney in Your Day, tagged me to do this tag! She is also a Disney blogger, so be sure to check her out. Since this video was Disney themed, I invited my husband Nick to join in! Enjoy! What is your favorite film of the era? What is your least favorite film of the era? What is your favorite song of the era? What do you consider to be the most underrated film of the era? What is your favorite thing about this era? What is your least favorite thing about this era? Did you enjoy this tag? What are your thoughts on the Disney Golden Era Films?